I've been having a bit of a rough time, so it has been a while between posts. 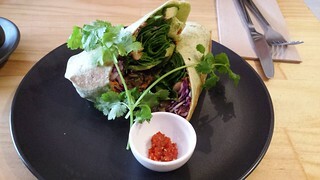 But here is the final part of my early July Melbourne trip! After the epic carb fest of Saturday breakfast, brunch, lunch, and afternoon tea, we had a bit of a late dinner. Our friend Michelle came over and we watched the latest episode of RuPaul's Drag Race, as well as ordering all of the food from Loving Hut Northcote to be delivered. We ordered A LOT. Clockwise from the top left: lemon chicken (though they forgot the sauce! 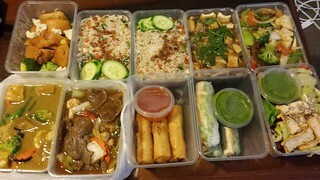 ), two lots of fried rice, mushroom and tofu stir-fry, noodles with veggies and mock duck, rainbow salad, rice paper rolls, spring rolls, Mongolian beef stir-fry, Japanese curry. It was a lot! Alas, the Mongolian beef and the Japanese curry ended up being a bit too spicy for me, but the rest was very good. We are so much. Not going to lie, after this day of eating my tummy was less than impressed with me... but it all tasted so good. Sunday morning a light breakfast only was in order. I had my Smith & Deli apricot danish, a banana and a mandarin. Then we went to a special advanced viewing of Kedi. If you haven't seen it, I highly recommend it. It is very bittersweet, and very well done. I cried. Afterwards we went for lunch at The Snug Public House in Brunswick, which had received some good blog reviews. My friends, I will not be going back. First of all, it is tiny and full or drunk people drinking Guinness and being noisy. Secondly, the food was not the greatest. 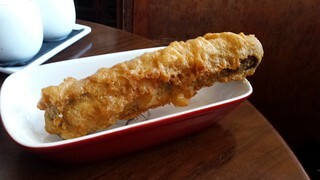 Poor Leigh ordered a Battered Sausage (literally a deep fried Tofurky sausage, no sauces or anything came with it) and the Curry Cheese Chips. These were a disgrace. 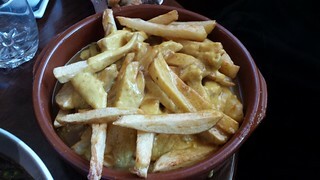 The chips themselves were OK, but they were covered in a runny sauce that tasted of nothing except perhaps the very faintest wiff of old Keen's curry powder. A lot of salt made it a bit better, but it was Not Good. 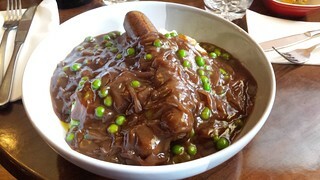 My Bangers and Mash was better, and I did enjoy it. The mashed potatoes were actually really good. The sausages were Italian-style Tofurky sausages, which were kind of spicy and not the right flavour choice for this kind of dish. There were two of them, on top of a huge mound of potatoes. It really was too much food, though The Snug seems to pride itself on obscenely huge servings. The gravy was not bad, but was oddly sweet. Thankfully the potatoes were nice and salty so it balanced it a little. That night we ordered in again, following an afternoon of watching cooking shows followed by watching She's All That (Leigh had never seen it) and Not Another Teen Movie. This time we ordered from a Japanese place in Brunswick that I had been keen to try. Unfortunately, their delivery menu is very limited compared to the actual restaurant menu. 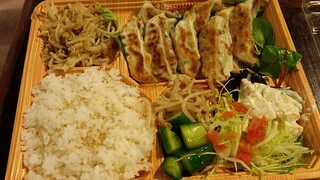 There are three vegan options, and we both got the vegan gyoza bento. 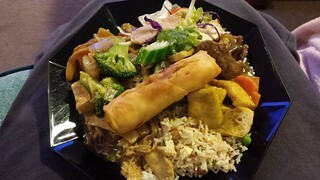 It said it came with rice, salad, pickles and stir-fried vegetables. The vegetables were just bean sprouts with soy sauce, the pickles were some sort of spicy cucumber rather than the tasty Japanese pickles we were hoping for, and the salad included a suspect creamy potato salad (that we avoided just in case, there is no vegan potato salad on their regular menu). So eh, but still tasty and something a bit lighter. The next morning we went to Wild Timor Coffee for a light breakfast. 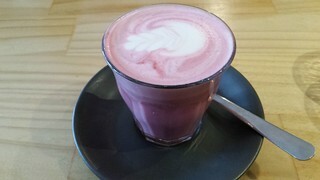 I started with a Beetroot Ginger Latte (on soy, no honey), which was pretty and pink and mostly tasted like ginger. 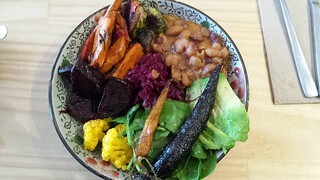 Leigh got the vegan option on the Breakfast Burrito, which she enjoyed, and I had a delicious Buddha Bowl (roasted sweet potatoes, beets, brussles sprouts, and baby carrots with avocado, beans, turmeric pickled cauliflower, fermented red cabbage and balsamic reduction). It was amazing. 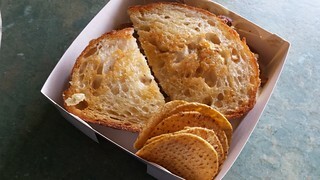 Before I headed to the airport, I stopped by True North and picked up a vegan reuben to take away. It had housemade pastrami, vegan cheese (which was kind of tasteless), mayo and sauerkraut. 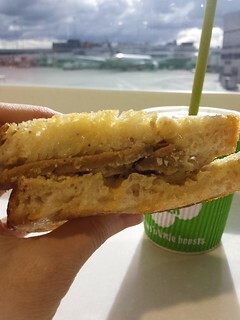 I ate it at the airport with a Matcha smoothie from Boost Juice for lunch before my flight. I have heard varied reports about this reuben. It was OK, mostly it tasted like caraway and sauerkraut. Not terrible, but there are much more exciting reubens out there. Of course no trip to Melbourne is complete without bringing home some treats! 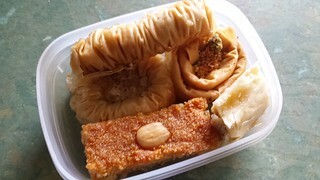 First up, a little box of yummy Middle Eastern sweets from Al Nada Sweets, an all-vegan sweet shop that was near Leigh! 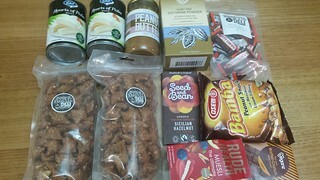 And my haul from visiting Smith & Deli and The Cruelty Free Shop. The two big Smith & Deli bags are full of peanut butter pretzels! I have actually been back to Melbourne since this trip for OzComicCon, so that was a very different sort of experience. I will get around to sharing that trip soon! Of course the highlight of the trip was getting to meet this awesome little dude. 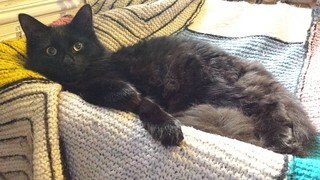 Chia has since made the move to Sweden, and is now living the high life as a Swedish kitty! I loved Kedi! Saw it a couple weeks ago. :-) Lovely film. SO MUCH LOVING HUT FOOD!! That is an amazing pile. And hope you're feeling better soon!! We really committed to as much food as possible that day. He was such a fluffy floof! Sending hugs, hope you feel better soon. Chia is a very handsome boy! I saw Kedi too and enjoyed it; although, the part about the kitten was disturbing. I have a hard time with movies that include any animal deaths, and so David looked ahead of time to see if there were any. The information he'd seen didn't include the part about the kitten, and so that was an unwelcome surprise. Still, I would recommend the film too. I'm sorry that you've been having a bit of a rough time. Thinking of you. Chia!!! Look at all of his floof! !